HONOLULU – The Hawaii Department of Transportation (HDOT) advises Oahu motorists of overnight closures on the eastbound H-1 Freeway at the Palailai Interchange between the Campbell Industrial Park/Barbers Point Harbor Off-Ramp (Exit 1A) and the Farrington Highway Overpass on Monday night, Sept. 26, 2016, through Friday morning, Sept. 30, 2016. 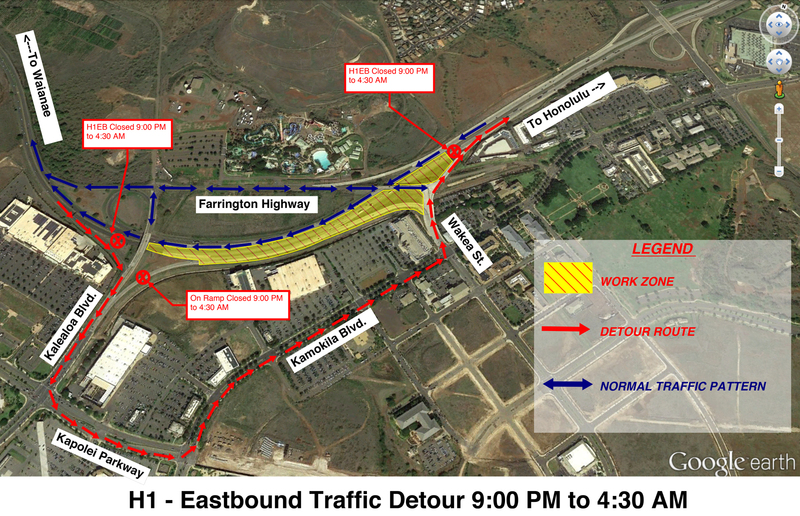 One lane will be closed from 8:30 p.m. to 9 p.m. and all lanes will be closed from 9 p.m. to 4:30 a.m., nightly, for lane shift re-striping work and placement of portable concrete barriers for the Kapolei Interchange Complex Phase 2 project. The eastbound lanes on the H-1 Freeway will be shifted to the left towards the median to relocate a 30-inch waterline that is currently under the right shoulder lane. This is necessary to accommodate the new bridge abutment for the Kapolei Interchange. Portable concrete barriers will be installed to isolate the work area from oncoming traffic. Electronic message boards have been posted on the eastbound H-1 Freeway and Kalaeloa Boulevard to notify motorists of the closures. Special Duty Police Officers will be on-site to assist with traffic control. Emergency vehicles, first responders and The Bus have been notified of the roadwork and will be allowed through the work zone. Roadwork is weather permitting.